Yisra was a Redguard student enrolled at the College of Winterhold. 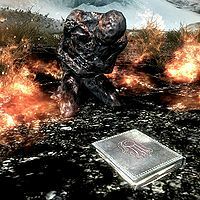 Her charred corpse can be found in a circle of scorched earth east of Dawnstar, along the shore immediately south of Yngvild. By speaking to Phinis Gestor, you can learn she was one of several students that have gone missing recently. However, nothing seems to come from finding her remains. Yisra's necklace and a small amount of gold can be found on her body, and a copy of Spell Tome: Flame Cloak is set before her corpse, so one can assume she got the incantation wrong. Her necklace and the tome are not quest related and do respawn after a few days. Yisra was to be included in an unfinished quest in which you are tasked with finding her and the three other missing apprentices. In the quest, you bring Yisra's Necklace back to Phinis Gestor, who will say "Gods, this is hers, isn't it? She will certainly be missed." There are two versions of Yisra in game data. The one listed in the NPC Summary box above is not actually used in the game. The version which is used in the game is considered to be a container (a burnt corpse), and has the form ID 000EF5F6 and reference ID 000EF5F7. This page was last modified on 27 January 2016, at 21:04.